Changing weather conditions greeted Team SUZUKI ECSTAR in their first European round, with rain falling in the morning making the FP1 session wet, and sun arriving in the afternoon for a dry second session. 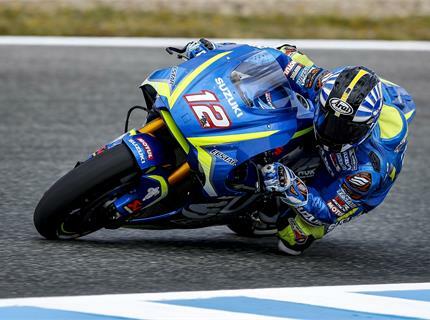 In these conditions both Andrea Iannone and Takuya Tsuda were able to lap consistently and gave engineers useful data, although the final results are not completely satisfying: Iannone ends this first day in Jerez with 16th place, while Tsuda is in P19. The morning session saw Andrea Iannone make solid progress run after run, cutting nearly a second from his lap time. While during dry conditions in the afternoon, his performance was affected by a less than optimal feeling with the electronics which are in need of improvement. The different conditions of the track were very useful for the riders and the team in gaining experience, but did lead to a delay in the practice program of the engineers. Suzuki’s test rider Takuya Tsuda debuted in his MotoGP race aboard the GSX-RR that had been left available by the injured Alex Rins. The Japanese rider was able to experience both wet and dry conditions and his performance was solid. He consistently ran close to the top 15 and improved run after run.